REVIEW: I don’t relish writing this. I don’t often write negative reviews because I generally like to keep the 13th Dimension vibe lively and upbeat. Life’s too short to run down everything you may dislike. But as a devoted fan of the Batman ’66 TV show — who’s also been an ardent cheerleader of DC’s usually ebullient comics series — I can’t let this one go. 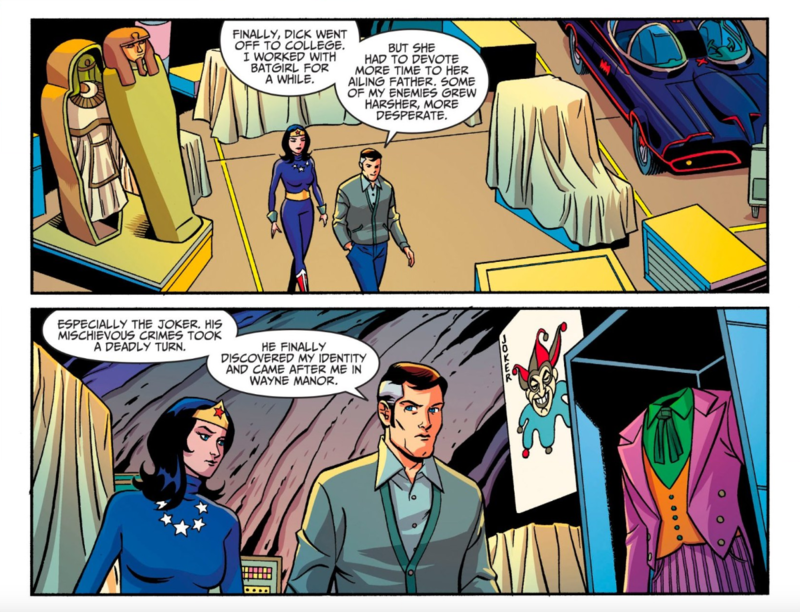 That’s because the final two issues of Batman ’66 Meets Wonder Woman ’77 — the last of which came out this week — were a depressing misfire that featured the most discordant note in the 51-year history of the franchise. It has nothing to do with the pacing, or the art or — most certainly — Mike Allred’s always wonderful, joyful covers. 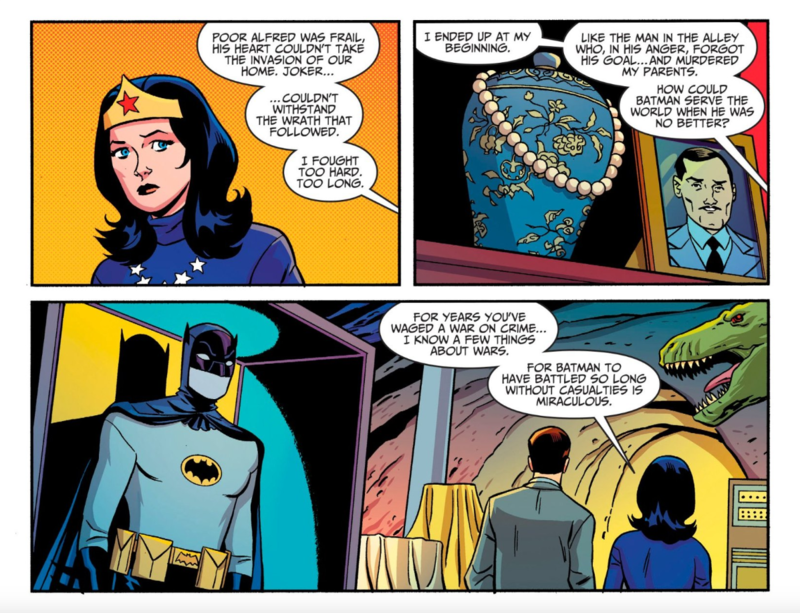 That’s right, Batman — Adam West’s Batman — tells Wonder Woman that he’s a murderer. Now, going into Issue #5, we knew that when the story picked up Bruce Wayne would be retired. I wondered myself what would make this particular Batman — the eternal optimist — hang up his cape at this stage in his life. Even with gray at his temples, I couldn’t see him giving up the good fight. On no level, in any way, would this version of Batman, this duly deputized agent of the law, ever commit such an extreme act. This is a Caped Crusader who believed in justice, not vengeance. Who was the ultimate, incorruptible, paragon of virtue. Seems to me the writers, whose bodies of work I respect a great deal, were going meta: The groovy ’60s were over and the darker, disillusioned ’70s had taken hold. As we know, the Joker in the comics became a killer once again and Robin gave up the short pants to become Nightwing (though in real years it took until 1984 for that to happen). But in taking the idea to its illogical extreme, they pulled the whole narrative off the rails: Nothing, and I mean nothing, would have gotten this version of Batman to take a life, not in the world first concocted by Messrs. Dozier, Semple, et al. Hell, even Frank Miller’s Batman — the alpha and omega of grim-and-gritty Dark Knights — refused to kill the Joker when given the chance. It’s what gave the climactic scene of the best chapter of one of the greatest Batman stories ever — 1986’s The Dark Knight Returns #3 — its raw power: The most hardened Batman, despite everything, will torture, maim and threaten but he will not kill. So if the writers thought they were making some commentary about the end of innocence, they missed the mark. I didn’t write this when I first read Issue #5 because I held out hope that there would be some further explanation in Issue #6, which came out this week. Maybe, I wondered, Batman was under some kind of delusion perhaps fomented by the Scarecrow. Or something. But no, there was no reference to the murder, no recriminations, no guilt. Just the heroes happy that Batman was out of retirement and back in action. What makes this an especially bitter pill is that this may be the last Batman ’66 miniseries we’re going to see in some time — if at all — though there have been persistent rumors that DC is monkeying around with an idea for another. At least we have the Allred family’s Batman ’66 Meets the Legion of Super-Heroes one-shot in July, and I can’t wait to read it. I’m certain that the taint of this story won’t be a part of that. But as far as longer form stories, this is a downbeat way to go out. Last year’s animated movie Return of the Caped Crusaders made great sport of just how absurd the notion of a Dark Knight Adam West is. And of course West, who died just this month, himself took great pride in calling himself the Bright Knight. It’s too bad that the writers of this story took note of neither. 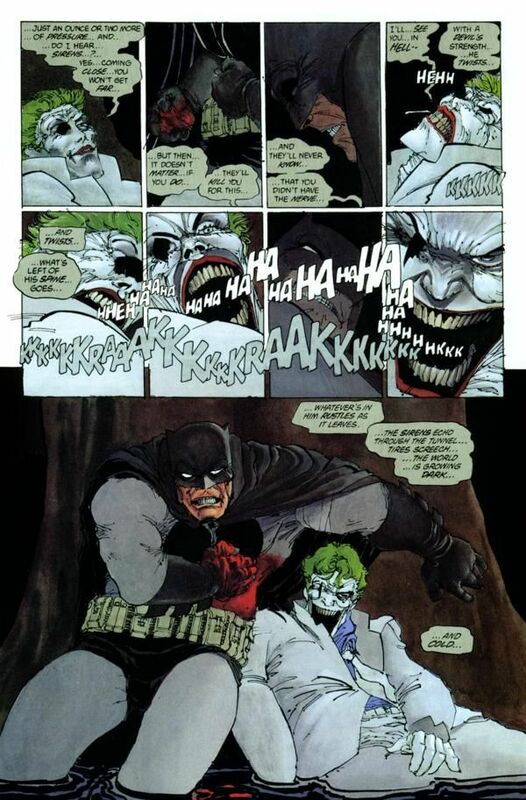 For all the people Joker has killed, this would be the logical ending. People seems to forget that Batman is also human. He killed the Joker, not because he wanted to kill him, but he was forced to do so, because there is no other way. For me, the writers did a good job writing this story because it didn’t end in a campy humorous note as everyone expects, but on a very human level. That makes it a good story. And I can’t understand why the author is confused with Wonder Woman’s reaction. She’s a warrior. An immortal warrior. She understands what Bruce feels. You cannot make an omellete without breaking a few eggs. She’s not a warrior first. She’s a diplomat first, a talker of peace. Her people have a saying that you never fight if you can talk peace and you never kill if you can restrain. She does not kill without an absolute necessity, and this is Wonder Woman ’77, which means she NEVER kills. It’s not in her nature. Having served 25 years as a law enforcement officer…(spurred by Adam Wests Batman)… often evil doers force a reckoning by their actions. based on the stated fact of home invasion and resulting death of Alfred ( Criminaly Negligently Homicide) from this criminal act, I would reconsider a change from using the term Murder to Justifiable Homicide. Death of the suspect during these felonys commited in a home, would be reasonable. From a legal stand-point, in the real world, I agree, Gerry. But Batman is capable of things none of us in the real world are, and he has a higher obligation to stop threats without ending a life than we do, just as a marine or a trained martial artist would be considered to have in reality. Further, it’s a story, and the end of a story should not be a matter of what is most realistic in our world, but what is plausible in theirs AND fits the tone of the story. For Batman ’66, the tone has always been — and always should be — one of optimism, with good triumphing over evil because it’s good. It needs no other reason. The writers should justify how it happens, but why it is written that way? It needs no justification because that is what the story is about — Batman finding another way. I disagree batman accidently killed someone in the first episode! The Cesar Romero Batman 66 Joker to boot. Makes no sense. Thrush HQ and kill all the Thrush agents inside. Like Adam’s Bruce Wayne, the character of Napoleon Solo would have NEVER made a suggestion like this. It undermined the character of every U.N.C.L.E. agents whose main weapon was a sleep dart. By the end of the issues they had generated into a “James Bond” pastiche with little left of the U.N.C.L.E. ethos and character traits. Did you expect anything different in their treatment of Batman himself by the end? While I admit I have yet to read this (I always wait for the hard cover editions) just judging by the frames shown I don’t get the impression that Batman killed the Joker… or even that the Joker died. What I read into this is that ALFRED died and Bruce blames it on his obsession with crime fighting as it was the Joker’s discovery of Batman’s identity leading to the attack on Wayne Manor which caused Alfred to have a heart attack. Still a little dark for the Adam West Batman But, this would not be the first character who died on the series. There were around a dozen or so who died on the series including one whom Batman himself killed in the Batcave in the 1966 movie. Many of us knew they were going to eff up this title as soon as Ra’s al Ghul was mentioned. Indeed the first warning bell went off back when Harley Quinn was mentioned. 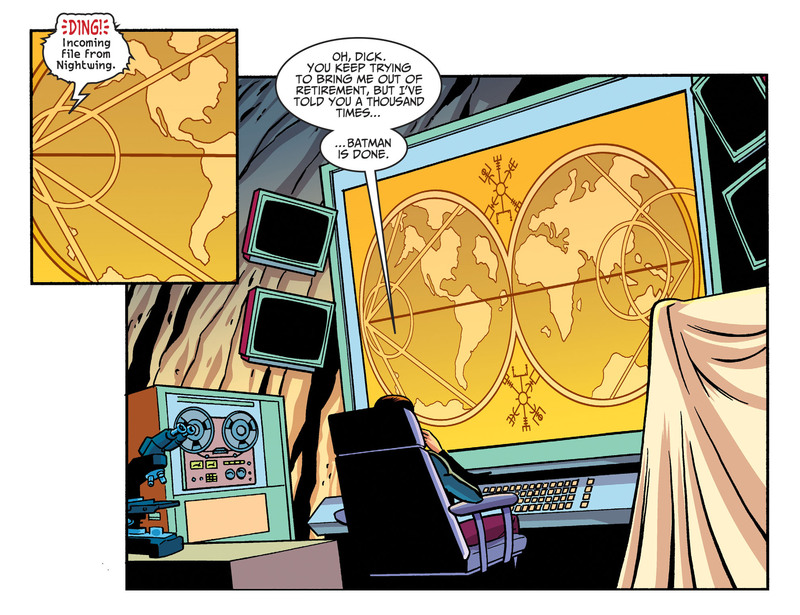 As soon as al Ghul appeared, the contamination of the present was introduced into the storyverse and it was doomed. The really sad thing is all the people who blame “The New 52” for everything bad in DC Comics (and even the movies) and don’t seem capable of recognizing how long the cancer had been active in the body. This author is to be commended in identifying Miller as the true source. The solution to this issue never was to only use villains the ’66 show ever used, that way you only would eventually end up with a constant retread of things the show already did, but in a different medium, in which a few things that work in TV never could work in the printed page. Ra’s and Harley themselves aren’t the issue as long as you used them in a way that could fit the ’66 spirit without following it to the point of it being restraining. Alan Moore, and all the “British invasion” writers did more and more lasting damage to DC than Miller. Miller’s original Dark Knight and DKR may be overrated and too often referenced, but it was clearly a highly-stylized alternate universe and never much impacted the depictions of any of the characters in the main titles (no moreso than All-Star Batman & Robin). Miller’s only lasting impression on the franchise was Year One. Moore and co., however, were allowed to severely warp the world that the serial comics would carry forward. I’m not happy about this either but I’m going to play Devil’s Advocate and suggest that this death wasn’t out of character at all. I’m also going to argue that Batman didn’t kill Joker. In the 1966 movie, when Bruce is being held captive by his foes, he threatens to kill them – violently – if they’ve harmed Miss Kitka. This isn’t self-defense, it’s clearly a threat of vengeance and a particularly gruesome one at that. Bruce had become very enamored of Kitka in the brief time they’d known each other and he didn’t hide how much she meant to him from his captors. In issue #5 of the comic, Bruce clearly states that Joker discovered his secret identity and came after him in Wayne Manor. Not the Batcave but Wayne Manor. While it isn’t overtly stated that Joker intentionally killed Alfred, it’s certainly implied and obvious that Bruce blamed Joker. Bruce had fought too hard and too long and had had enough. The Clown Prince of Crime had killed his beloved friend. It was time Joker felt his wrath, but not Batman’s wrath; Bruce Wayne’s. Long story short; Batman didn’t kill Joker, Bruce Wayne did. Yes. That page of issue #5 chafed me as well. It’s inferred that Mr. West’s Batman murdered The Joker because The Joker discovered Bruce’s secret and brought about Alfred’s death. There’s the good argument that actual ’66 Bruce Wayne threatens violent death. And that Bruce killed The Joker. Still, you are correct. It’s a downer. And yet, what reason could a writer devise for ANY Batman to retire and pass on that mantle?What would make Mr. West’s Batman reach the end of the never-ending battle? As a follow-up: Batman did not kill anyone in the series. Molly fell to her death. Batman was trying to save her. The Riddler caused an explosion. But he survived that. Catwoman fell to her death – not once but twice – Batman and Robin tried to save her. In most cases Batman has tried to reform and save and rescue his adversaries on the series. I would more than guess that The Joker caused his own demise – or, “fell” to a supposed death. Maybe he faked his death? I’d argue that, if any of the ’66 villains were going to turn into dark and gritty murderers, that’d actually be Riddler, not Joker… other than maybe Nora Clavicle, whose plan relied on city wide genocide, Riddler always was the most unhinged, closest to snap villain in that setting. The movie nails it when, out of all four main villains, Riddler always acts as the most trigger happy and least happy with teamwork, and Joker himself actually has to restrain or calm him down a few times. Here it looks it happens with Joker because, well… everywhere else, it’s always Joker, ignoring the context given by THIS series.